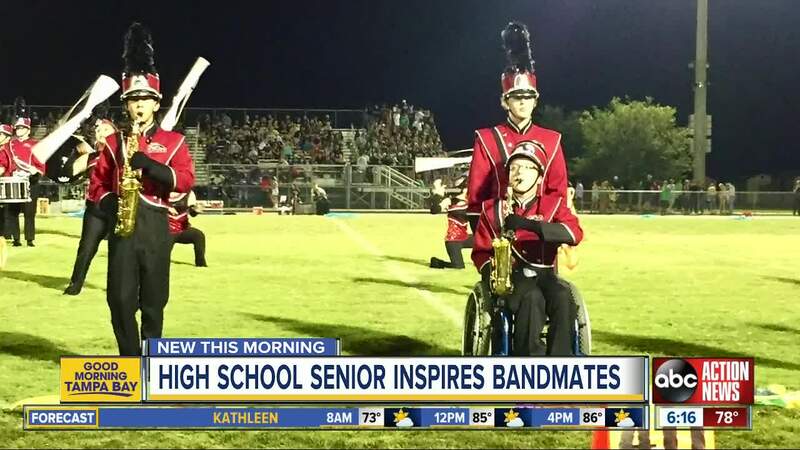 Marcus Werner, a senior at Strawberry Crest High, doesn’t let spina bifida stop him from playing in the school’s marching band. He gets help from freshman Rob Rodriguez. DOVER, Fla. — Marcus Werner, who was born with spina bifida, didn’t want to sit on the sidelines. He’s a saxophone player who wanted to join the marching band at Strawberry Crest High School, never mind the wheelchair. So four years ago, he did just that. But his friends in the band had a solution. And now, the senior at the Dover school is finishing up a remarkable musical career here, one that he’s accomplished by having an appointed band member push him through complicated marching formations. This year his unorthodox duet partner is freshman Rob Rodriguez, who admits he was “hesitant at first” to take the gig. Rob is an IB student, which takes a studious toll. Plus he wasn’t sure how he’d be received by the rest of band. After all, he doesn’t play an instrument. He keeps Marcus moving. “But I was welcomed,” says Rob. Band and orchestra director Cheri Sleeper says Marcus and Rob are so good at what they do, they blend into the marching movement. “They’re part of the band like everybody else,” she says. With just a few performances left in his high-school career, Marcus says Rob is one of the best on-field helpers he’s ever had.